It wasn't what I was expecting when I did my morning check for slugs and worms on the tomato plants. But here they are... my first harvest of tomatoes. This is all new to me so I am going with instinct here ... the tomatoes look ripe ... so we harvest! All along I've wondered why these were turning red when tomatoes much larger on other plants are still very green. Then I read yesterday that this variety (Patio tomato) is a smaller tomato... makes sense now. Today was a maintenance-in-the-garden sort of day. I mowed, edged, trimmed some ground covers and blew off all the surfaces. We were expecting some much needed rain this evening so it was breezy and almost balmy with high humidity and temps in the 80's. For lunch I took a break. I was looking forward to it knowing that I was about to eat fruit grown right from my own garden. It didn't take me long to slice up all three tomatoes. I sat outside on the back lanai and enjoyed my tasty harvest alone. No sandwich, no lettuce or bacon or onion, just slices of tomatoes on a plate. There will be plenty more for all the combinations of summer sandwiches. It seemed only fitting to give this first harvest centerstage. This is exciting stuff, people. This is exciting. I don't think I even need to ask, "were they good"? You ate them the best way I know of... plain! Congratulations. Once you grow your own food, life is never the same in the garden again. Oh gosh, you are gonna make me get out there a plant a tomato plant. Yummmmmm How many napkins did you need for the juice. I can just imagine sinking your teeth into your first tomatoes. These are truly firsts, first grown first harvested. Hooorraaaaaaaaayyy. Meems, your tomatoes are simply beautiful! They just don't look like that in the store. And of course now you know they don't taste like store-bought tomatoes either, thank goodness! 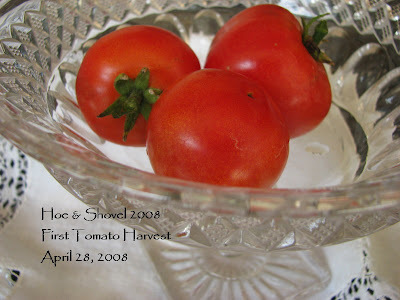 There's nothing in the world like fresh-picked, home grown tomatoes. Of course, everything from the garden tastes better than it's store-bought counterpart. Tomatoes though, are in a class by themselves! Yum! Now that's a lunch...sitting on the lanai, just you and the tomatoes in the breeze enjoying your garden. Hooray for you and you're right, this *is* exciting stuff! It's still too cold here to even set my tomato transplants out, so try not to think about how jealous I am. Great post title, too!!! Theres nothing like growing your own is there - a real sense of achievement. My tomato plants are only 2 inches tall at the moment!! Meems, lovely. I wish I could grow tomatoes but the last few times I have tried they got tomato blight disease. Even if they don't get a disease they don't really have time, or enough sun, to ripen many fruit before the winter in my garden. But I will probably try again, just for that one home grown tomato! Please excuse me for asking but what is a "lanai"? Perhaps a post and some pictures? First harvest! First harvest! You are a tease. We won't even plant out tomatoes for another three weeks! And then, more often than not, we end up with blossom end rot! You lucky, lucky woman! I can't wait for homegrown tomatoes. My attempt last year was a complete bust, and I wont' be seeing any until at least August. Congratulations! I hope you enjoyed the fruits of your labor. Wow, tomatoes already. I can't wait, yet I have to. Congratulations and enjoy. Store bought tomatoes will never measure up to what you grow yourself. I know they were as tasty as they look! Thank you all for cheering me along on my tomatoe harvest journey. I was so dog-tired when I finally got to writing this post that I forgot to say how wonderfully awesome and tasty my little red orbs were. When I finished my lunch all I could think to describe them was something like "Now THAT'S what a tomato is supposed to taste like." It is truly a dream come true to walk out to my vegetable garden and check it out daily... just to have vegetables growing in my own garden... what a treat. Even hubby is amazed at how well it has done... I keep saying ... "so far anyway"... I know there are trials still to come. It is all worth it for the sheer delight and challenge. Syliva: To answer your question... a lanai is just a fancy word for the screened in enclosure around the pool. We have seating under the roof covered portion and it is where we eat most of our morning and evening meals until it gets too hot. I eat lunch there as often as the weather (aka heat) allows. Your blog is wonderful. Very creative. I love those toms! You've joined the ranks of vegetable gardeners for sure...your tomatoes look wonderful! And tomatoes are the absolute best thing to grow yourself...nothing can compare to homegrown tomatoes! Woo hoo! Congratulations on your tomatoes. Sometimes the tomatoes are so beautiful that I have to remind myself they were meant for eating! Glad you didn't have that problem. becky: why, thank you... I'm glad you stopped by for a visit. leslie: It has really been a fun experience... I'm sure there is so much more to learn and to know. But I do feel I've leaped the biggest hurdle which was just the fear of the unknown. Now it's just a matter of working with it as I go. Thanks for the encouragement. Vertie: Actually I DID ask myself what was I waiting for and then sliced away... tomatoes are beautiful aren't they? Holy cow, tomatoes already? It seems like the last time I made my rounds of garden blogs that you had only just put those guys into the ground! How lucky! And they're simply gorgeous to boot. My tomatoes are just now starting to bloom, so perhaps by the next time I decide to make my seemingly bi-annual posts and blog visits I may have some fruit, too. thingsilove-marmee.blogspot.com rachel and i are coming to ocala at the end of may. hope to see you and talk gardening with a much more exeperienced gardener, there is so much i have to learn.